Acupuncture has been around for thousands of years, so although the concepts of Traditional Chinese Medicine sound foreign it has withstood the test of time. In Traditional Chinese Medicine the focus is on the energy or Qi that flows through the meridians (little channels) along the body. When the Qi gets stuck, slowed down, or overflowing we start to get symptoms. Qi gets out of balance due to emotions, trauma, dietary reasons, and stress. Acupuncture works to balance the Qi for optimal health. I look at many things do determine where the Qi is out of balance, including your physical appearance, symptoms, your tongue, and pulses. Once I have determined where the inbalance is coming from I use acupuncture needles or a little laser in certain points to improve the balance. Acupuncture can be profoundly relaxing, its great to come get a seasonal tune up, even if nothing in particular is going on. 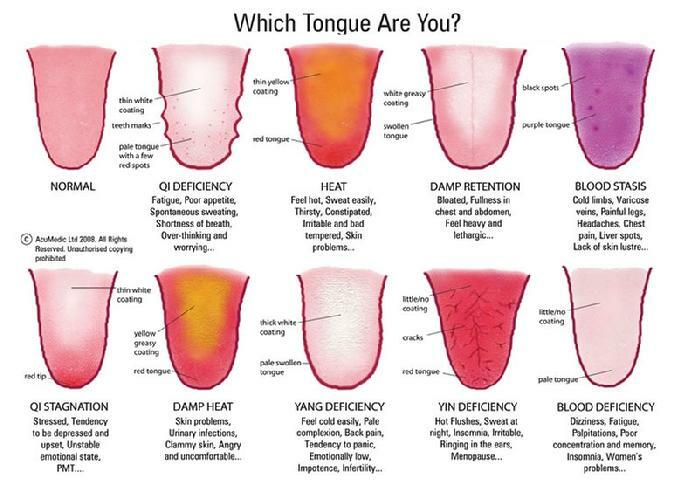 What does your tongue say about you? Go ahead, get in the mirror and take a look. If your tongue isn't normal call and make an appointment or book one online now!